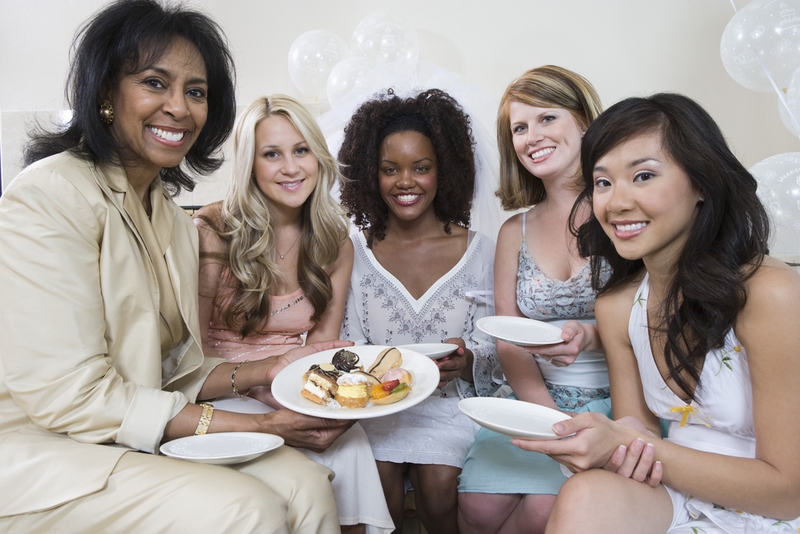 Your best friend or your sister is getting married, and it’s up to you to plan the perfect bridal shower. It should be fun with perhaps a few misty eyes as you help the bride-to-be celebrate her upcoming nuptials. The event will gather friends as well as family, not all of whom know the bride well and some of whom might be too proper for bachelorette party games, which tend to be raunchier. Bridal shower games help everyone get along, and small prizes help guests to remember the party after it’s done. Below, you’ll find some of our favorite bridal shower games. These games require your guests to write something down, so make sure to have plenty of pens or pencils on hand. You can find templates to download online while some of these games can be purchased if that’s easier. Use a copier if you have a lot of guests to save money. This bridal shower game adds an element of chance. Your guests will check their handbags for items and earn points based on how common they are. For example, players might get one point for common items such as driver’s license/ID, keys, pens or lip balm. Guests earn three points each for gum, cell phone or store cards. People get five points for menstrual products, coupons or pain killers. Points increase for less common items such as tissues, bandages, gift cards, sunglasses, nail files, stamps, and sunblock. Players get the most points for passports, having more than $100 cash, having 5 or more credit cards. What really ties this game into the bridal shower is earning 25 points (the max number of points) for having a photo of the bride-to-be or directions to get to the party! The lucky person with the most points – perhaps the biggest purse! – wins a prize. Simply print words related to the wedding or being a bride scrambled. It’s easy to make. Simply scramble some wedding-related words and add blank lines next to them for guests to guess the actual word. The following is an example list, but you can really cater it to the bridal couple by adding their names, names of their children or pets, names of the bridal party or scrambling another piece of well-known trivia about the couple! The winner will unscramble them first. In the case of a tie, have someone spell “boutonniere” correctly! So you’ve got a group of friends and family gathered to celebrate your bride’s upcoming nuptials. This is the perfect time for a little personal trivia. It makes your bride feel special, helps guests better get to know her – maybe she’s a hopeless romantic – and can be funny to boot! You can choose any questions, but here are a few to get you started. Where did the couple meet? If the bride could have any super power, what would it be? How did the groom propose? Or how did the bride get him to propose? Where would the bride travel if she could go anywhere? What’s the bride’s least favorite chore? When was the bride born? Where? Which quote about marriage does the bride believe? Of course, you can get more creative if you think the guests would know more obscure trivia about the bride or couple – if it’s a combined shower. You can award more points for more difficult questions, too. This fun bridal shower game is perfect when you’ve got a mixed crowd, but you can play it with people from just the bride’s side. Collect a bunch of facts about your bride and groom. Include those that are embarrassing, funny and out of character. It’s good to look for some stories that aren’t so well known so this game won’t be so easy. Then, your guests will guess who did it – the bride or groom! Make sure to have enough time for your bride to explain the funny moments! The last of the written games to play at a bridal shower is easy and quick. Take a list of chores and have your guests write down who the bride thinks should do them. Close friends and family might have a leg up because they know how much the bride hates washing dishes, but you might throw your guests for a loop if your bride is one who likes working on a car or finds vacuuming to be a calming activity! Not everyone is into readin’ and writin’, and that’s okay! Try some of these bridal shower games, instead. Your guests might find this game to be more fun than simply earning points for what’s in their purse. The bride gets in on the action by calling out items that might be in a purse, and guests frantically search their bags for the item. Whoever pulls it out first wins a prize. You’ll need to print up different Bingo cards with squares containing words related to weddings and marriage. Create a master list of the words and cut the list into squares to pull them randomly from a hat. Players can use stampers or physical markers when they’ve got the word on their Bingo card. You’ll need to do a little prep work for this bridal shower game. Set aside some time with the groom to ask him questions like those you’d hear on the popular game show of the same name – not the type of questions a couple should be asking before marriage. You can keep things positive or ask more silly questions, which your bride-to-be answers. Here are some sample questions. What was your fiance’s pet’s name while growing up? What’s an annoying habit the bride has? What item of clothing does the bride wear that looks the best on her? You’ll also find some question ideas in this double-dating idea post. Although the guests don’t play this game, it is good to include the bride. Record it and let the groom watch later, perhaps as a one-year anniversary gift. More ideas in this post. If you’re looking for games to play at a bridal shower that are funny and a little less common, why not try this one? In this game, each guest will tell two truths and one lie about themselves while others try to guess which is the lie. The truths can be outlandish, and the lie can be mundane to throw off those who are guessing. This game serves as an icebreaker, which is helpful because not everyone at the bridal shower will know the others. Who knows, one of your guests might be a great liar! The bridal shower games on this list include both traditional and modern games, so you can mix and match to find the games best suited to your bride and groom. Make sure to include the groom and his guests for co-ed bridal parties. It’s also wise to consider how many guests and how much time you’ll have. Any game where people take turns, such as Two Truths and a Lie, can take a lot of time in a large group, whereas bridal shower games where guests race to finish will be quicker. The right games help to create laughter – a great social lubricant – and ease the tension that might occur when a group of strangers comes together. Trivia about your bridal couple can help you to celebrate their special day and the moments that have come before, too. Make sure to send your winners home with some sweet gifts for playing your games.